Dry Barrel Fire hydrants are manufactured in strict accordance with the AWWA C502 standard; Wet Barrel Fire Hydrants are in accordance with the AWWA C503 standard. 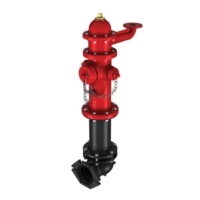 The United Model F-06 "Fire-Flo" Dry Barrel Fire Hydrant is fully compatible with the industry leading fire hydrant; all parts, kits, and tools are interchangeable, allowing the end user to standardize on inventories and operator training. The F-06 has many years of field proven service. The F-06 is UL Listed / FM Approved and is rated at 250 psi water working pressure. All bury depths are in stock for immediate shipment, in either open left or open right configuration. Fire hydrant parts, tools, and kits are also shipped from stock. 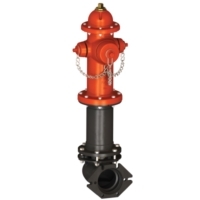 Specify the United F-06 "Fire-Flo" AWWA Fire Hydrant on your next project. 3. 5 ¼” Design provides Maximum Efficient Flow. 4. Forced Lubrication System eases Lifetime Operation. 5. Hose and Pumper Nozzles are threaded and field replaceable. 7. All buried bolts are 304 stainless steel. 9. Elbow and Drain Ring Housing are Fushion Bonded Epoxy Coated for Superior Corrosion Protection per AWWA C550. To learn more about pricing, product customizations, delivery times and more, please call United Water Products directly at (877) 766-4459 or send us an email through our Contact form.